Map of Business Area Singapore. An extremely scarce 1934 F.M.S. 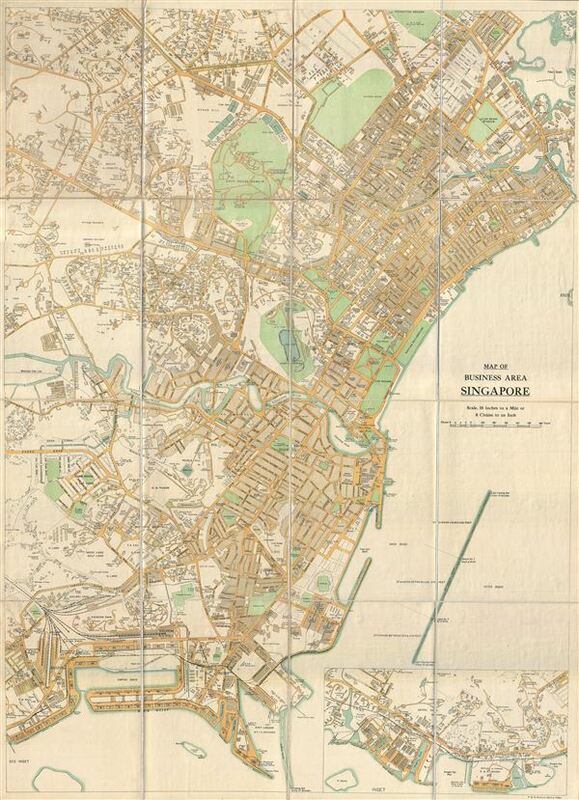 (Federated Malay States) Survey map of Singapore's downtown business district. Presented on a scale of 10 inches to the mile, this highly detailed survey covers roughly from the Mount Victoria / Goodwood Hill area to the mouth of the Rochor River south to Keppel Road and Empire Dock. An inset map in the lower right quadrant details the harbor region to the west of Keppel Road as far as Clementi. Throughout the map offers extraordinary detail with countless individual buildings and homes noted - especially in affluent areas like Goodwood Hill and Mount Victoria, where individual homes and families are textually identified. All public parks, streets, cemeteries, municipal buildings, docks, cinemas, rail stations, social clubs, and the like are also identified. The map has been dissected and mounted on linen in twelve sections. Published by the F.M.S. Survey Department in 1934. The OCLC identifies only one other known example in an institutional collection of Cornell University. Presumably others must exist in Singapore's national archives though we have not been able to identify them. Very good. Folds into original linen binder. Dissected and mounted on linen in 12 sections.